Anyone may view the website to use for their own personal use only and not for reproduction on any other website or for commercial gain. The content of this website is provided for your general information only. Although we make every effort to maintain the accuracy of information on the site, content may not be accurate and complete and is provided 'as is'. All such information on this site is necessarily subject to change, sometimes at short notice. We are not responsible for the content of third party sites linked to the site or for third party content. They are independent of us, and their content is not endorsed or approved by us, even where the third party in question is stated to be a 'partner'. Our site and the intellectual property rights in the site are owned by or licensed to us. Certain names, words, images or logos identifying us and the products and services featured in the site are the trade marks of the Mote Park Fellowship. The names and logos of third parties mentioned in the site or in the third party contents may be the trade marks, trade names or unregistered trade marks of those third parties. In the event that you own intellectual property that appears on the site without your written consent please notify us. Where downloads of third party software are made available on this site, they are owned by the third party licensee in question and will be subject to any terms and conditions applied by the relevant third party. The Site may contain proprietary notices (such as moral rights and trade mark notices) and copyright information, the terms of which must be observed. 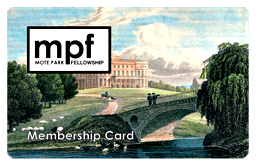 The Mote Park Fellowship shall not be liable for any direct, indirect or consequential loss or damage or for any costs, claims or demands of any nature whatsoever arising directly or indirectly out of the use of your contribution or any part thereof. You agree to indemnify the Mote Park Fellowship in full against all liabilities, costs, claims or expenses in relation to a third party claim that your submission or contribution infringes the intellectual property rights of that third party. From time to time we may run competitions, free prize draws and promotions. In each case, these will be subject to additional competition terms, which will be made available at the appropriate time. The terms and conditions and the use of the website shall be governed by English Law. All claims or disputes arising out of or in connection with this site shall be subject to the jurisdiction of the courts of England.